Below is the news feed for Swanpool Nature Reserve. Check here for the latest information on the reserve including news on activities, wildlife and rare bird sightings. One of the most serious threats to Swanpool Nature Reserve comes from people illegally dumping garden waste at the site, this is a particular problem when the waste contains invasive species such as Japanese knotweed which has colonised areas of the pool. It is illiegal to spread knotweed outside your property so it is very important that it is disposed of properly. Knotweed canes can be composted provided they heve been dried out first, any newly pulled knotweed or knotweed crowns musty be burnt rather than composted. You should contact your local Environmental Health Officer before starting a fire. If you see anyone dumping waste at Swanpool you should make a note of the vehicle type, registration, time, date and any other details and then contact the Environment Agency hotline on 0800 807060. Further information about Japanese knotweed can be found on The Cornwall Knotweed Forum's website by clicking here. - Increasing nutrient levels from agricultural run-off and domestic detergents. - Pollution from urban run-off caused by the density of nearby housing development. - Deliberate introduction of non-native animal species, such as terrapins, to the pool. 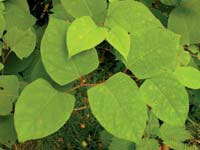 - Spread of non-native plant species such as Japanese knotweed, through dumping of garden waste in the area. - Be careful to avoid disturbing wildlife. - Don't go near nesting birds - keep to the paths. - Don't release animals like terrapins into the wild. They are not native to Britain and introducing them causes problems for other species in the pool. - Please take all rubbish home with you.